LIFE IS WHAT HAPPENS TO YOU…. Crosby, Stills, Nash, and Young are Live Sunday April 28, 2002. Never Mind that this concert was supposed to happen on Friday March 15th, 2002. 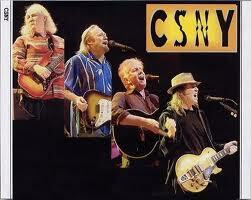 Neil Young, the man who asked to regroup for a second CSNY tour in the last thirty some years, got the flu. We all know that it is next to impossible to perform when we are sick, so the show was “Rescheduled” for Sunday, 4/28/02. This worked out perfect or is reviewer, Mr. E.T., as it was a non-work night, and therefore easier to get away without a lot of pre-scheduled run-around! It was very convenient! So, Reverend Lee and his wife, Lori Phillips, met me at “The Old Spaghetti Factory” in down-town Tacoma just before the show, for some delicious pasta, bread and spamonie ice cream, and even a cocktail. We were only minutes away from the Tacoma Dome where the legendary rockers, I often refer to as a law firm, (Get it? C.S.N.Y and Associates), were to perform in just a couple of hours! How exciting. Parking was a blast, and we even skipped the customary Ramada Inn cocktail before the show, which is usually a long island ice tea. We had our cocktails at the restaurant, and were ready for some rock and roll, sensitive harmony, fantastic original songs, and a little legendary magic! Our seats were fantastic. They cost about $92 which is kind of high, but this event only comes around an average of once per decade, so it was worth the price to us. Believe me. Neil Young is always good. I have been fortunate to see him now 6 times, including a rousing show with family members and historic players in Colorado “Red Rocks Amphitheatre” in September of 2000, but that is another story for another time! I was also lucky enough to catch CSN without Neil on the “Daylight Again” tour in Seattle 12/07/82 at The Key Arena, then named “The Seattle Coliseum”. That also is another story for another time! They were great though, I would like to mention, EVERY time I have been blessed enough to see them! So there you have it! The show kicked off just ten short minutes late of the show time @ 8:10 pm. sharp! Believe it or not, they opened up with THE SAME SONG they did on the CSNY2K Tour I saw just two short years earlier on 02/02/2000, and the was the fitting “Carry On”. Great harmony on that one, and it basically said the band was continuing its message of peace and love and hippie madness from the sixties and earl seventies. “Carry on……. Love is coming…… Love is coming to us all”. Boy were they right! Just for starters, their backup band was none other than the famous “Booker T. and The M.G’s” featuring the original drummer, Legendary Bass Player Donald “Duck” Dunn, and Keyboard whiz Booker T. Jones himself. You may remember this was also the nucleolus of the “Blues Brothers” band led by Paul Shaffer of Dave Letterman fame, and immortalized in two classic movies directed by John Landis that starred Dan Ackroyd and John Belushi (Who’s role was replaced by a new character in the 2nd film played by John Goodman). 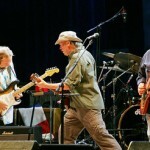 This is some history for a band, and the only notable absent players tonight was the fabulous sax-man (who was unavailable touring with James Taylor), and guitarist Steve Cropper who was not needed in a band that all ready has FOUR lead guitar players, two of which can double on keyboards! 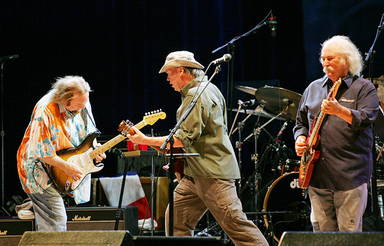 (That would be Graham Nash, and Neil Young). The band proceeded to put on a show that consist of two sets, with a twenty minute break, consisting of OVER THREE LONG HARD HOURS OF MUSIC)! Here is how the set went down! Steve Stills sings a classic Booker T. Jones song. Suite To Judy Blue Eyes (Stills classic about the folk singer JUDY COLLINS) HOT GUITAR SOLO HERE! It was a lot of music, they wanted us to get our moneys worth, which came to a little more than $30 per hour, and in my opinion worth every minute of it. 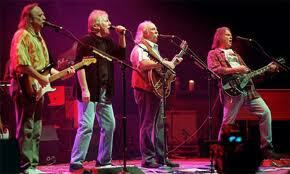 Having seen them twice in the last two years, it was interesting to note that each time they did approximately 30 tunes, and only did about 10 of them twice between the two tours, Some of their classics MUST be played at every show, or it just is not an authentic CSNY Show. Last tour they were promoting a new album called “Looking Forward” and therefore played about half of its tracks, and this time they did not play a single one of those cuts, to my dismay. That was a GREAT RECORD. They had to make the cuts somewhere though. 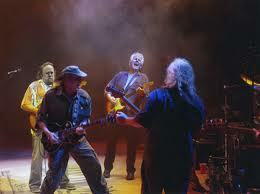 they have so many great songs out, they cannot do them all………UNFORTUNATELY! Thumbs up from this reviewer on a great show. 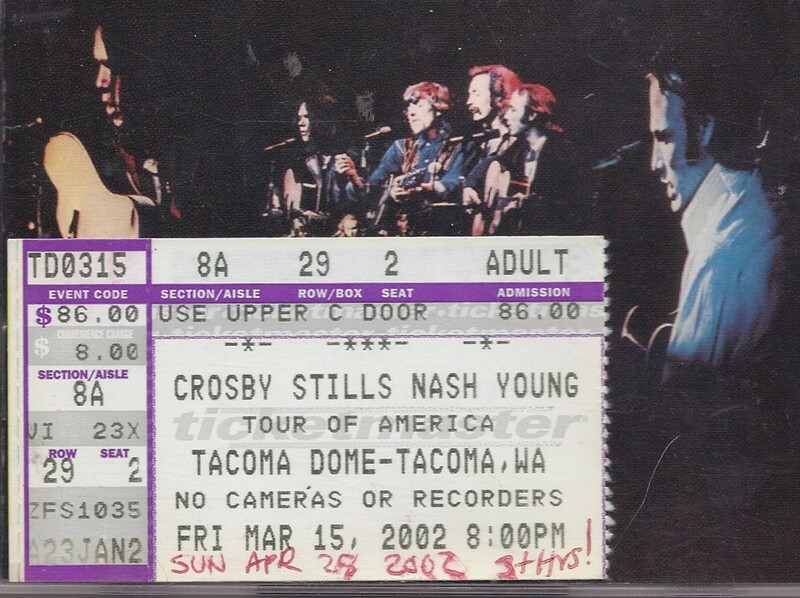 Neal Young did make a snide remark about the way the Tacoma Dome echoed, and he also mentioned this was the 2nd to the last stop on the tour, which would do its final show in Oregon at “The Rose Garden” in Portland. This venue is owned by our own Paul Allen, who also happens to own the “Seattle Seahawks” football team, “Portland Trailblazers” basketball team, and is the founder of the EMP museum in Seattle! Bottom line! This tour ROCKED and was well worth the wait. 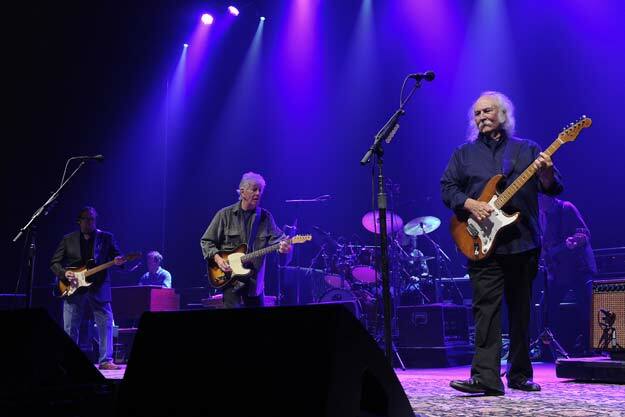 The song writing talents of these four individuals (David Crosby, Steven Stills, Graham Nash, and Neil Young) is astounding. Together they make music magic! I only hope they choose to tour again…… and again……. and again!!!!!!!!!!!! 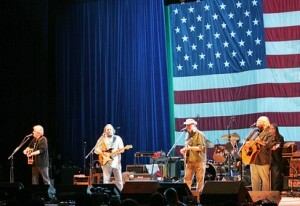 This entry was posted in Concert Reviews by ericturnbow. Bookmark the permalink.